Sorry, there are no shows on sale at Prince of Wales Theatre right now. 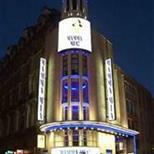 The Prince of Wales Theatre is a West End theatre in Coventry Street, near Leicester Square in the City of Westminster. It was established in 1884 and rebuilt in 1937, and extensively refurbished in 2004 by Sir Cameron Mackintosh, its current owner. Built in 1884, the Prince's Theatre was renamed The Prince of Wales in honour of the future King, Edward VII, two years later. From its inception, The Prince of Wales Theatre had great success; the musical comedy Dorothy that ran from 1886 to 1888 made its author enough money to build the Lyric Theatre just around the corner on Shaftesbury Avenue. Initially, the Prince of Wales Theatre was known for its musical comedies and wordless mime performances, but staged its first straight play in 1898, Pelleas et Melisande. From then on, the Prince of Wales Theatre varied its productions and these varying styles brought varying success. Following an unsuccessful spell under the management of actress Edith Evans, from 1932, the Prince of Wales Theatre exclusively staged revues in the Folies style with comedians and risquÚ dancers. These shows proved so lucrative that the income from these performances alone paid for the demolition of the original Prince Of Wales Theatre and the construction of the larger, existing building in its place in 1937. Since the current building was opened, the Prince of Wales Theatre has enjoyed great success in a variety of productions, notably a run of Broadway musicals in the 1960's, including Funny Girl with Barbra Streisand (1966), Sweet Charity (1967) and Burt Bacharach's Promises Promises (1969). Other notable productions in recent years include Underneath The Arches (1982-1983) and Andrew Lloyd-Webber's record breaking Aspects of Love starring Michael Ball (1989-1992), which was the Prince of Wales' longest running production before Mamma Mia. The nearest tube station to the theatre is Piccadilly Circus. The closest train station to the theatre is Charing Cross. For buses, use 14, 19 and 38. The closest car park is Westminster City Council Car Park at Leicester Square. Wheelchair access is available at the rear of the stalls, accessible via the ground level foyer. If you cannot transfer out of your chair companions can sit beside you. They also have a number of transferable seats available. For all queries and bookings for access, please call 0844 482 5137. There is a hearing-Impaired infra-red system in the auditorium and induction loop at the Box Office. Guide dogs allowed into auditorium, alternatively the venue staff are happy to dog-sit. To book and information on access please call 0844 482 5137.